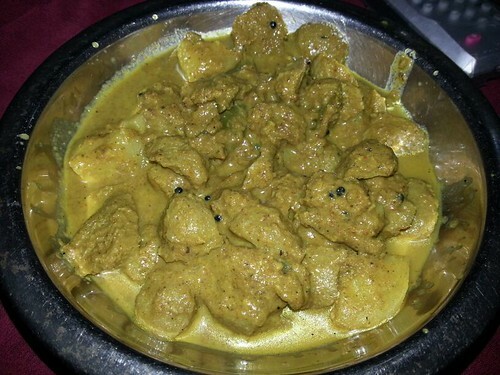 Soya Beans and Kozhi (Chicken) Varutharacha Vechathu refers to one of the foods in Kerala, India made of Chicken meat (Kozhi) and Soya beans simmered in coconut milk and lots of spices. like Turmeric, Chili, Black mustard seeds, Cumin, and Curry leaves . It is a soya beans and chicken Curry. Varutharacha means the dish is made with roasted and ground coconut paste.